If you are wondering why you are constantly flooded with annoying pop-ups during your web browsing sessions, check whether you have Between Lines on your computer. This is yet another adware application from the SuperWeb family that distributes third-party content through its ads. You should remove Between Lines from the system because it is not safe to have an adware program running on your computer. You may argue that Between Lines is not a malicious computer infection, but adware programs can be easily misused by malevolent third parties, so you should not take your chances. Since Between Lines comes from the SuperWeb family, it exhibits the same features as Pine Tree, Air Globe, Traxxen, Web United, and others. It also means that the official website for the application at betweenlinesnow.com is absolutely useless. You cannot download the application directly, and we would not expect the download button to work because all programs from this group are usually distributed bundled with other shareware. Hence, when you are ready to remove Between Lines from your computer, keep in mind that you most probably have to delete several other unwanted applications as well. 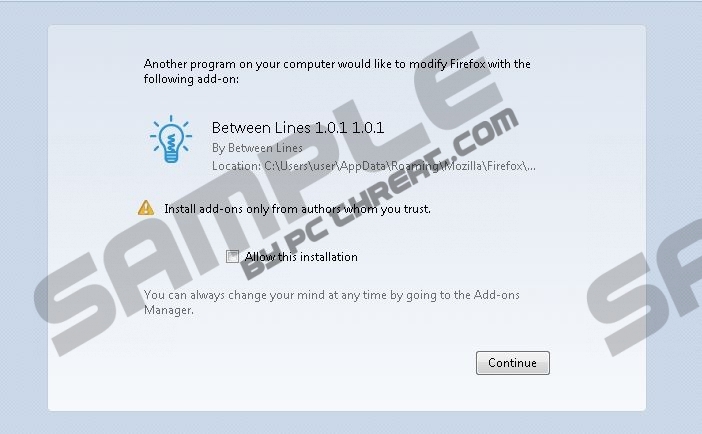 According to our research, Between Lines comes bundled with freeware downloaders from Malavida.com. For example, if you download a Torrent client application from the aforementioned website, it is very likely that the installer will set up several additional applications, and Between Lines will be one of them. Thus, you can avoid installing Between Lines if you stay away from third-party file sharing websites. It would also be a good idea to check all the installation steps on setup wizards because more often than not users are given the chance to avoid installing Between Lines. However, in the case Between Lines managed to enter your system; you should not panic. Between Lines gets installed as a browser extension for Mozilla Firefox and Internet Explorer. Although the app does not work on the newer Google Chrome versions, it can still collect information on what websites visit, thus generating customized commercial advertisements. These ads might look extremely annoying, but they are the main security concern associated with Between Lines, and the reason you must remove this application. Some of the ads might contain outgoing links that lead to dangerous websites. You should never click Between Lines ads because it could eventually result in a malware infection. Save yourself the trouble of dealing with severe computer security issues by removing Between Lines today. Please follow the removal guide below to terminate Between Lines manually. After manual removal, you should acquire a reliable computer security program because there might be more unwanted applications that must be deleted, and you also need to protect your PC from similar intruders. Select Uninstall a program and remove Between Lines. Go to Uninstall a program and remove Between Lines. Select Add or remove programs and uninstall Between Lines. Quick & tested solution for Between Lines removal.